This time of year is always really busy for our Education Team and already the S.O.S. 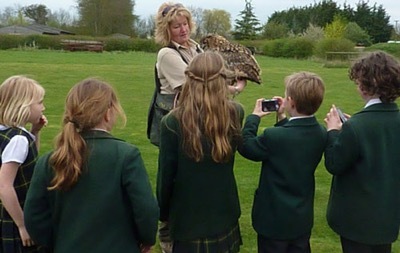 Wise Owl Roadshow has visited a number of schools, including as far as Beccles and Lowestoft. As a point of information, we normally have a limit of an hour’s travel for our raptors as, although the birds we take with us are used to travelling, their health and welfare is of prime importance! The travel boxes in which the birds are transported are of course specifically designed for the purpose. Astro-turf covers the perches to allow the birds to safely grip them during movement and as with all animal carriers, the boxes have plenty of ventilation holes in them, although raptor boxes are especially designed so that you can’t put your fingers through - definitely not a good idea with some of our bigger birds! This Thursday saw the second school of the season visiting the Sanctuary itself and, as luck would have it, the weather was absolutely glorious. In fact, it was more like a bright summer’s day than an early spring one. When the children arrived, they were greeted by two members of the education team and given a guided tour of part of the Sanctuary. The tour always includes at least one member of each raptor group – Eagles, Owls, Hawks, Falcons & Buzzards and definitely wouldn’t be complete without a visit to Gypsy our charismatic American Black Vulture! At school the children had been working on a book called ‘The Owl Who Was Afraid Of The Dark’ by Jill Tomlinson, so their activity was tailored to reflect this. At the moment, we are also refurbishing our classroom area, so we asked the children to do a special owl collage for us. They had great fun getting bits of tissue paper and glue everywhere and the finished result was a fabulous multi-coloured, multi-textured long-eared owl, perfect to go up as part of a display. Although our regular programme of summer flying demonstrations was only due to start after the visit, our display birds have been exercising for several weeks now in preparation, so after lunch the children took a trip to the flying ground where falconer Maz was exercising Baloo, the Indian Eagle Owl. Everyone thoroughly enjoyed watching Baloo take to the air and were eager to ask questions and take pictures at the end. The children and their teachers told us they’d had a lovely day and had learnt a lot about all the different birds of prey. This is the second year they have come to visit us at the Sanctuary, so we look forward to seeing them again next year!